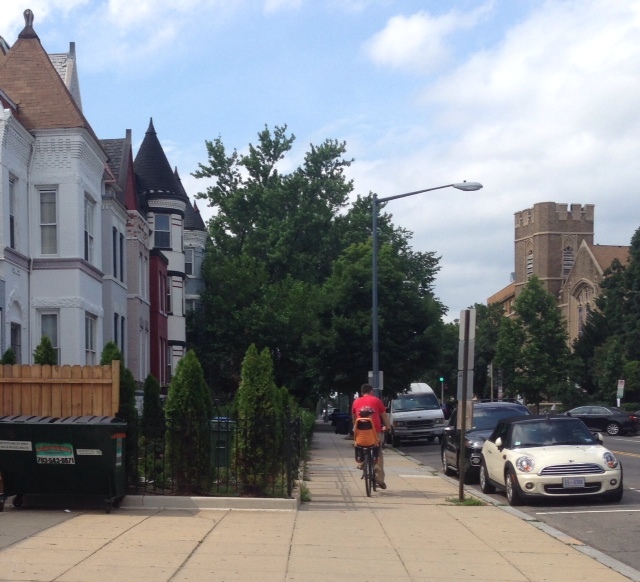 PoPville » Dear PoPville – Holding a Baby While Bicycling? Biking in the City with Kids in General? Monday night I was driving south on Georgia Avenue with some friends when we witnessed something disturbing: a man (25?) speeding down the hill on a bicycle, steering the bike with his left hand and holding a baby in his right. By baby I mean maybe 18 months? Definitely not old enough to talk. Neither were wearing helmets. We watched the guy run TWO red lights (and nearly miss and SUV turning onto Georgia at the first) before hopping on Florida and speeding away. First of all–this has to be illegal, right? Child endangerment? Secondly, I see lots of parents biking with kids, and it always makes me nervous (and I say that as a fellow city biker myself). Most parents do the all the rights things by biking in bike lanes, strapping their kids in seats, and making sure everyone has a helmet. But there are still so many things you can’t control for. I’m curious to know what your readers think: Is it always a bad idea to bike on city streets with kids? And when you see something so clearly reckless as we did last night, should you bother reporting it to the police? Were any laws actually broken (besides the running of red lights)? Why Does DCA have a District Zip Code if it’s located in Virginia (tax implications)?